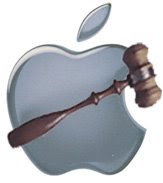 Apple's latest lawsuit comes from Mirror Worlds Technologies. The claim? Apple's Time Machine violates 4 of its patents that describing a "highly visual system that displays a line of documents & other items dating back (or forward) in time along with the option of searching these items to retrieve & edit them." Mirror Worlds Technologies is also claiming that the iPhone and various model iPods also infringe on Mirror Worlds Technologies patents ... apparently due to the way they sort podcasts and information. Mirror Worlds Technologies is seeking an injunction against all infringing Apple products in question, and "triple damages" - also called trebled damages. The patent seems quite vague. "Highly visual"? <--- what does that mean? I'm not quite sure asking for "triple damages" will help Mirror Worlds Technologies case ... a judge typically doesn't allow a damage to be trebled before trial. Typically this is something that is requested during the trial IF THEIR is one. What's also curious about this case - Time Machine has been out for well over a year - why has it taken so long?